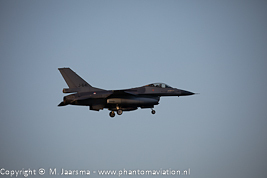 The Netherlands Air Task Force Middle East detachment operating with its F-16s from Jordan was ended on December 31, 2018. On that day the final mission supporting the international coalition fighting ISIS was flown. 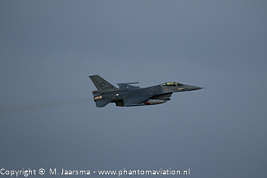 On January 2 the aircraft returned home with the other personnel, Belgian and Dutch, returning during the week. Two aircraft flew to Leeuwarden and four landed at Volkel. In the afternoon the resident 312 and 313 squadrons also started with their first flight of the year. 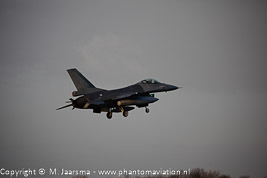 On Wednesday January 2, 2019 six (including two spares) Royal Netherlands Air Force Lockheed Martin F-16AMs assigned to Air Task Force Middle East (ATFME) returned to The Netherlands. 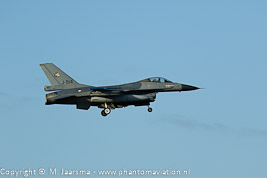 Two aircraft landed at Leeuwarden Air Base with the other four being welcomed by the RNLAF Commander Lt.Gen. D. Luyt and Director of Operations Air Commodore A. Steur. ATFME – 11 completed its it last mission two days earlier on December 31. 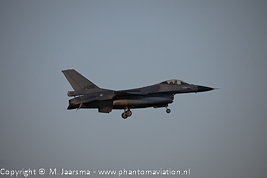 The Netherlands joined the international coalition in 2014 and deployed its F-16s (eight including two spares) to Jordan in October 2014. Rotation 1 flew its first mission over Iraq on October 5. 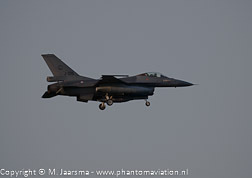 In Jordan they were joined by their colleagues from the Belgian Air Force. Due to budget limitations both countries agreed to rotate the mission between each other. The country providing the aircraft received force protection from the other country. 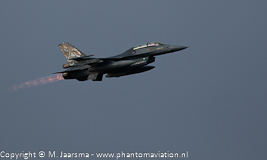 The RNLAF provided the F-16s – reduced to six aircraft (including two spares) from September 2016 - and crews from both Leeuwarden and Volkel air bases until July 1, 2016. Due to much needed maintenance on the fleet as well as retraining its pilots to other roles than flown from Jordan the RNLAF couldn’t support the mission any longer. However in between the ATFME assignments the RNLAF acted as the lead nation for the BAP mission (rotation 43) detaching four aircraft at Šiauliai, Lithuania from January 5 until April 30, 2017. The second part of the ATFME detachment started on January 1, 2018. Six aircraft (including two spares) were flown to Jordan with the aircraft and personnel again provided by both air bases. ATFME missions flown supporting the international coalition were Close Air Support and Interdiction aimed at destroying ISIS fighters, warehouses, vehicles and weapon sites. In 2019 the RNLAF will focus on the transition to the Lockheed Martin F-35A with eight aircraft to be delivered. Six are to be delivered to the NODF-35 (Nederlands Opleiding Detachement F-35 – Dutch Training Detachment F-35) which is part of the recently activated 308th FS, 56th FW at Luke AFB, Arizona by June 30. The other two will be delivered to 322 squadron in the fourth quarter by FACO Cameri, Italy. F-16 pilots not converting to the F-35A will be (re)trained on all F-16 missions and are responsible for the Quick Reaction Alert Benelux a role also rotated with their Belgian counterparts. Furthermore the F-16s are available to the NATO Response Force and EU Battle Group. ATFME first period: October 2014 until June 2016. ATFME second period: January until December 2018. Belgian Air Force: July 2016 until December 2017. J-020 still wearing 322 squadron markings after it left LCW Woensdrecht for Volkel in October 2018. 313 squadron F-16BM J-882 in its 65th years anniversary / NTM 2018 colors taking off from runway 06L. Returning after its mission one of 313 squadron F-16AM's. F-16AM assigned to 312 squadron departing runway 06L as last aircraft of a flight of four. 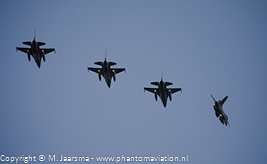 Arrival of the four F-16s assigned to ATFME - 11 at Volkel. F-16AM wearing the markings of 312 squadron. 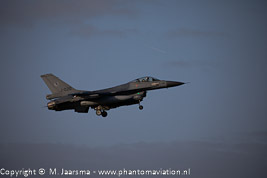 One of the two F-16s who returned without unit markings. The third F-16AM about to touchdown also devoid of squadron markings. and the last to arrive. J-146 wearing 323 squadron markings. All six F-16s departing Jordan in the morning and made a stop in Greece. From there they continued towards The Netherlands with the flight split into three formations of two aircraft. The first wave flew to Leeuwarden while waves two and three joined up in the air traffic control zone of Volkel before arriving as a four-ship over runway 06L.